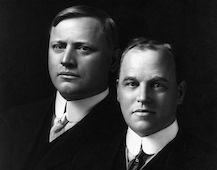 Who Were the Dodge Brothers? John Dodge was born in 1864 and his brother Horace was born four years later. They were born in Niles, Michigan, and grew up playing and eventually working along side their father who worked as a boat engine mechanic. The family moved around for awhile but in 1886 settled in Detroit. John and Horace both worked in various machine shops over the years and in 1896 they partnered with Frederick Evans to build bicycles, It was there that Horace patented the first sealed bicycle bearing. thus extending their life by blocking dirt. The Dodge brothers went from building bicycles to opening a machine shop to make stove parts and then to the more lucrative business of making parts for the burgeoning automobile industry. Their reputation for excellence quickly grew and soon they became major suppliers for the Ford Motor Company. Ford gave them ten percent of the company for their efforts and they used that money to eventually open their own automobile plant (that included the first automobile test track). The first Dodge vehicle rolled out in 1914 and was called the Dodge Model 30. It w'as built to compete against Fords Model T and exceeded that goal by producing the first 12 volt electrical system and a crude synchromesh transmission. The car sold well and dealerships popped up all over the country. In fact the Dodge brothers were so well thought of as machinists that 22,000 people applied for dealerships. As the years progressed they produced more and more models to meet the demands of the public and between the money they made selling cars and the dividends from their Ford stock they became very rich. However in 1920 both Dodge brothers succumbed to pneumonia and in 1928 the board of directors voted to sell the company to Chrysler.